Click on "Courses" link under "World" section on the Options Menu (pictured above at top). Use the search box putting in the most unique words/names from the course name (skipping common words such as "the," "club," "golf," "country," "course," etc.). You can also add the city and 2-digit state abbreviation. Typically the least number of courses to look through is with a search without the city and state with a one-word search. For instance, a search for "pinehurst" returns about 15 courses. A search for "pinehurst nc" returns 360+ courses from North Carolina and elsewhere because every course that includes either "pinehurst" or "nc" is returned in the results. The default arrangement of results is most relevant to least...much like Google searches. You may also want to enter only the 2-digit state abbreviation and then click on the "Address" column header text to sort alphabetically by city. You can then search for your city to see if the course is in the database. When you find a course you want to use with the handicapping, click on the "Favorite" link in the left column. Alternatively, you can click on the world Map of Courses to find a course (but will not be able to select it as Favorite). 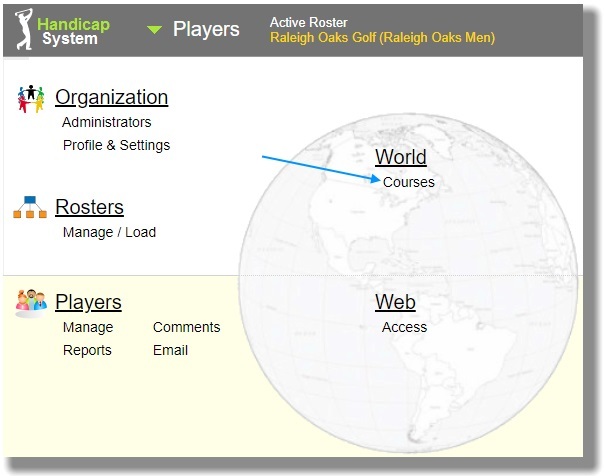 Courses in the database are available to all groups using Handicap System. Please makes sure when adding a course that the information is correct and up-to-date. 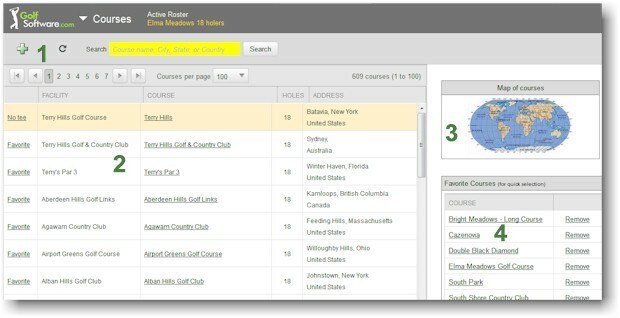 When you add an 18-hole courses, the 9-hole front and 9-hole back courses are automatically available when posting scores even though they are not listed in the Course Database. Please add 9-hole courses to the Course Database only when the course complex has no more than nine holes. If you cannot find a particular course, you can add it. 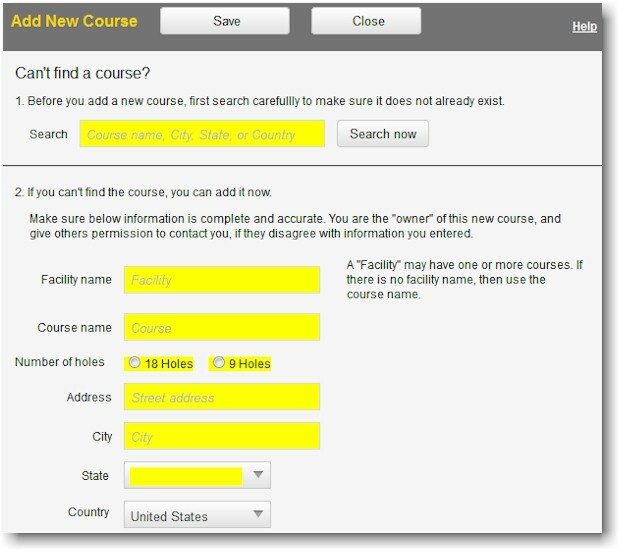 Please make double sure before you add a course that it is not in the database under a slightly different name. The Map of Courses feature could help you locate the course, if it is in the database. 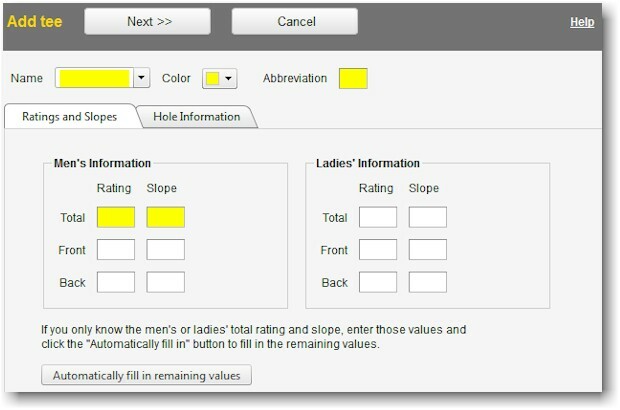 Click on the green "plus" icon (see Step 3 image for finding a golf course above) on the toolbar. Fill in the Add Course form accurately and click on the blue Save button. 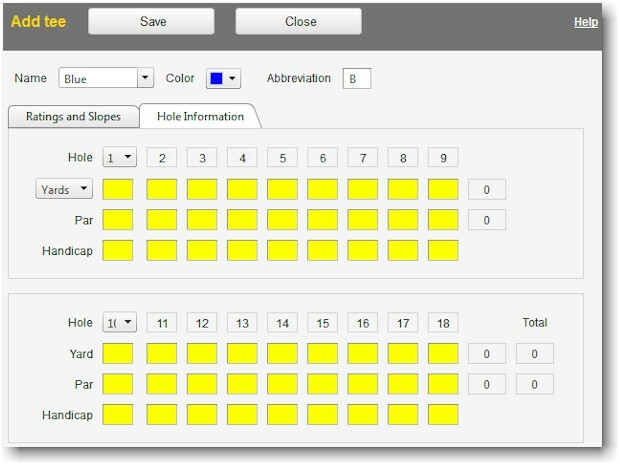 On the Edit Course screen add other available information and then click on the green "plus" icon to add information for a set of tees (yardage, par, handicap hole order). To add the tee name such as "blue," "red," or "white," select the color from the drop down menu. Fill in the Rating and slope as completely as possible. 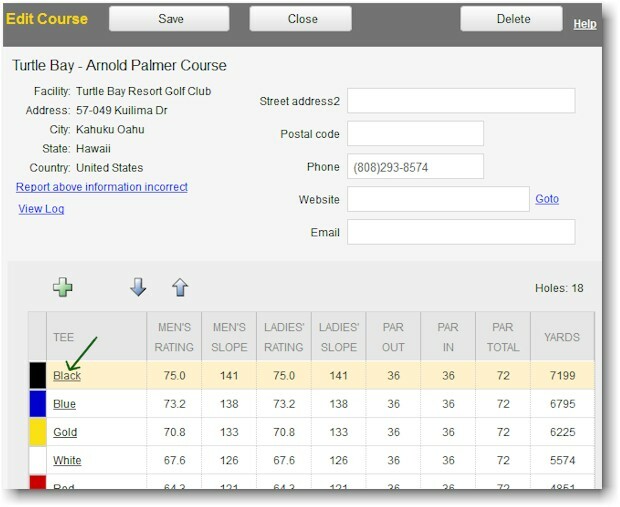 Click on the blue "Next" button to advance to the Hole Information form, select the distance units (yards or meters), and add the numbers for distance, par and handicap order for each hole. When finished, click on the blue "Save" button. Repeat steps to add more tees for this course. 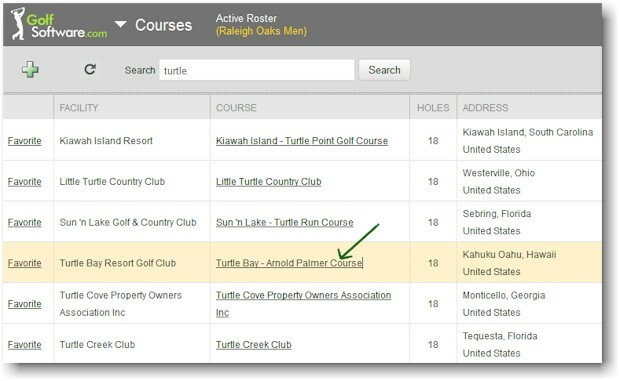 If you find that the course information in the Course Library does not match the current information for the course, you can edit the course and tees. 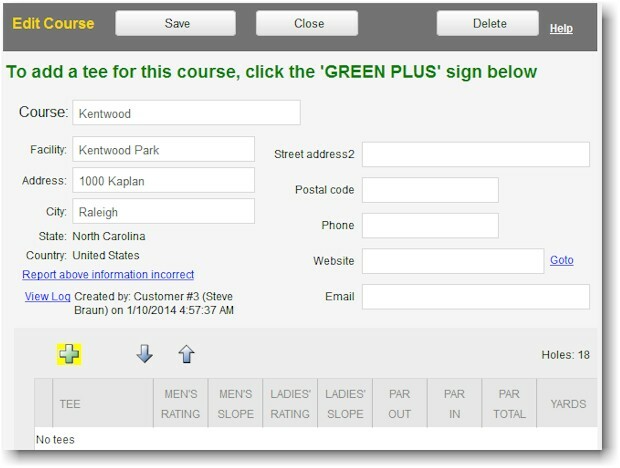 Your modification of the course information will NOT retroactively apply to pre-existing scores, but new scores added will use the newly entered course information. Find the course using the instructions above. 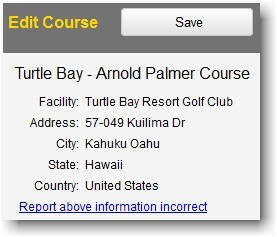 Click on the Course Name link (see arrow below). If the facility information is incorrect, click on the link, "Report above information incorrect." to notify us of incorrect and correct information. Click on the Tee Name link (see arrow below) to edit that tee. After finishing with your edits, click on the blue "Save" button.